The bocce ball courts located at the intersection of Championship Drive and Kerby Farms Road are available for your use. The courts are available daily from 8:00 a.m. to 6:00 p.m. Equipment is located in the bench seat at the south side of the courts. The rules of the game are posted on the bulletin board or are easily found on the Internet if you want to study up. If you are new to the game, the Bocce Ball Club plays each Thursday morning at 9:00 a.m. Join us to learn the game and enjoy the sport. The 2018 Bocce Ball Marathon was amazing. SunBird residents showed skills they didn’t even know they possessed. 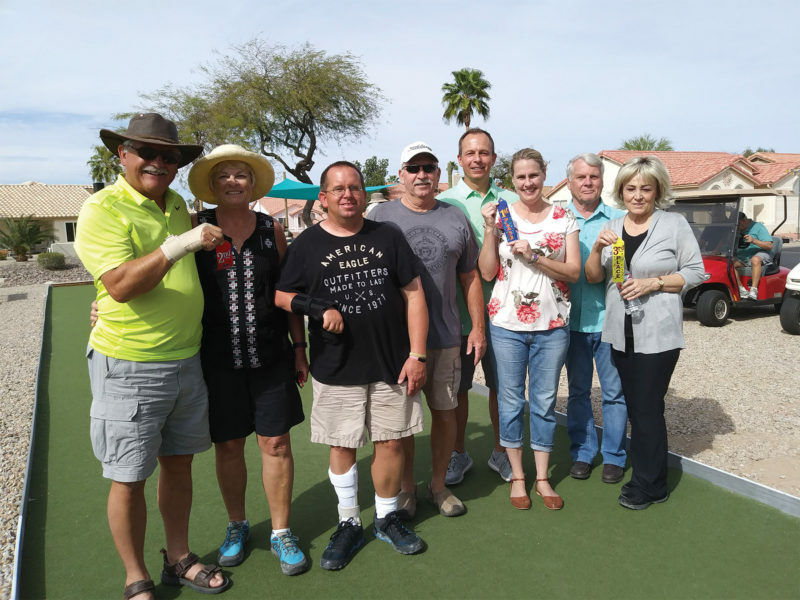 From the second week of January through mid-March, 90 SunBird residents participated in over 900 games of bocce. The marathon participants were divided into four leagues, and each competing team played each team on their league roster. Cash prizes were awarded for the top five places in each league. Coming this January will be more friendly competition. The 2019 Marathon will be bigger and better than last year. Registrations will begin in December, so grab a partner and begin practicing! Watch for announcements in the December SunBird News.